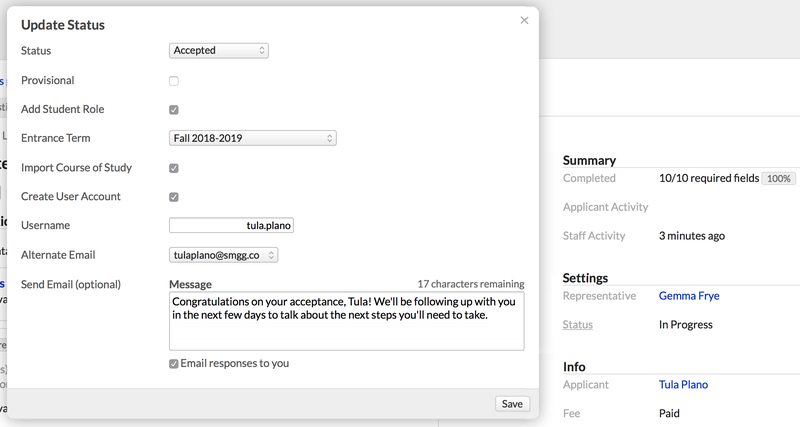 Here's how to accept an application and move a lead from applicant to student. These instructions work for most any situation. For example, if an application has been marked as Deferred and the applicant is now ready to attend, you need only follow these steps to accept the application and convert her into a student. First things first: make sure this application has been linked to a person! Nothing you're about to do will work unless you've done that. Under Settings in the right column, click Status. Provisional: If this is a provisional acceptance (maybe you're waiting on a transcript or follow-up on an incomplete field), check here; a text area will appear so you can note the reason for the provisional acceptance. Add Student Role: This gives her the Student role, which she'll need in order to enroll in courses at your school. Entrance Term: This is imported from the application; feel free to change if necessary. Import Course of Study: Check this to import the course of study information (program and degree) from the application to her Profile > Student view. Create User Account: Check this to add her as a user. Username/Email and Alternate Email fields will open up so you can set up her user account. Send Text/Email: If she has a verified text number or email address, you'll have the option to send her a brief, 160-character notification. Depending on the steps you elected complete, she is now an accepted student. You'll see the Student view on her profile, on which you'll find imported academic information. You may also see new financial information (e.g. default tuition schedule) on her Financial > Dashboard view. You can now begin enrolling her in courses, although your school's processes may require that accepted applicants Confirm the decision.